The Most Underrated Diabetes Exercise Strategy? Exercise is often positioned as an intense, dripping-with-sweat, I-can-barely-get-off-the-floor kind of activity. There is nothing wrong with that, but it can also set an unrealistic bar, or even turn exercise into a dreaded activity. For me, daily consistency is the biggest battle with exercise, which is the foundation of what follows: walking. It’s the first Bright Spot in the Exercise chapter of Bright Spots & Landmines for a reason, and in my view, is one of the most underrated in the book! Walking is one of my favorite Exercise Bright Spots – it predictably drops blood sugar (especially after meals), helps correct high blood sugar more quickly than with insulin alone, lifts my spirits, is easy to do, gets me outside, and the time can be combined with other enjoyable activities (calling family, listening to podcasts, deep breathing). Plus, walking is free and can be done anywhere at nearly any time of day. 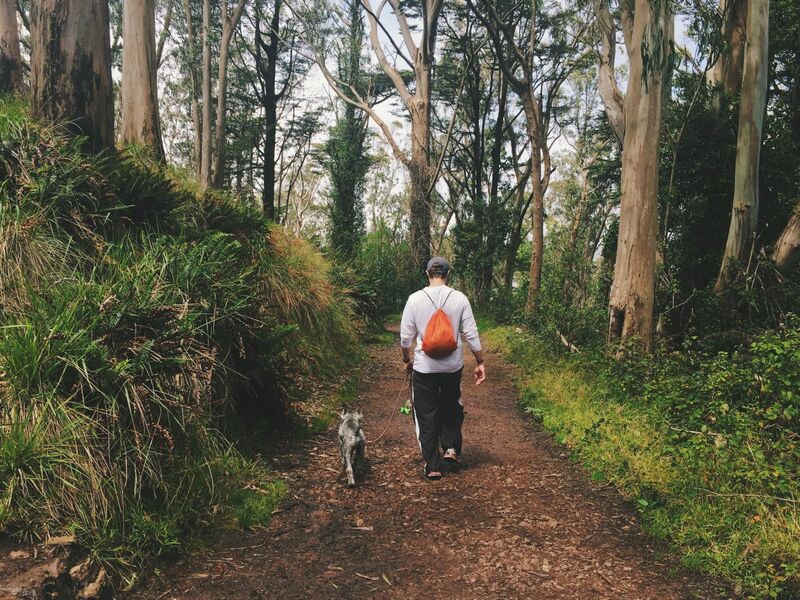 Without a doubt, walking is one of the most important therapies I use every day to benefit my diabetes, but it’s also one of the most underrated. I was shocked when I began measuring the blood sugar impact of walking – it’s surprisingly effective! When I’m strolling on flat ground at a normal pace, my blood sugar typically drops by about 1 mg/dl per minute, meaning a 30-minute walk often takes me from 160 to 130 mg/dl. 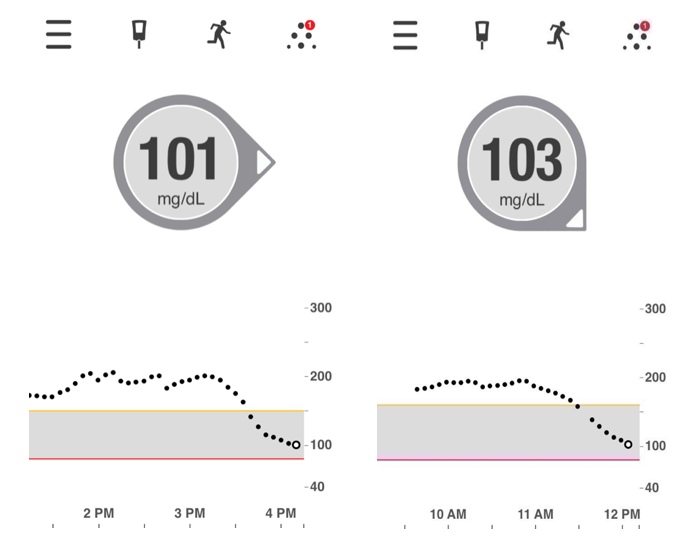 If I’m walking uphill or have taken some bolus insulin in the past two hours, I see an even bigger impact, often reducing my blood sugar by 2 mg/dl per minute or more (from 160 to 100 mg/dl in 30 minutes). Data from over 60,000 walking sessions in Diabetes Hands Foundation’s Big Blue Test program (2010-2016) confirm my findings. Following 14 minutes of moderate walking, the average participant saw their blood glucose drop by an impressive 30 mg/dl. Walking can also reduce the amount of food and correction insulin I need, and in some cases, replace those entirely. A typical insulin dose takes about 60-90 minutes to peak and 3-4 hours to completely finish working. That’s slow! With a blood sugar of 175 mg/dl, I could take three units of insulin and wait 90 minutes for my blood sugar to really start dropping, or I could take a brisk walk for 30 minutes. Even if the walk doesn’t bring me all the way back to target, it will usually take me to a lower and safer base from which to correct (e.g., 130 mg/dl). Post-meal walks are particularly effective: I often need about half as much insulin as normal, and in some cases no insulin at all. (The caveat is that I do tend to eat low-carb meals, where my normal bolus is only 1 or 2 units.) When my blood sugar is trending high after a meal, a walk can help course-correct me back into range without adding more insulin. Last but not least, walking also improves my mood and cuts my stress, which is exactly what I need with a high blood sugar. Ask for a treadmill desk at work (seriously) – there is no easier way to build steps into busy workdays in front of a computer. We are so lucky to have a treadmill desk in our diaTribe office and it makes getting 10,000 steps per day much easier. It’s also my go-to location when I have a high blood sugar reading during the day, and I often think better and work faster while walking. More employers are investing in wellness and offering perks like treadmill desks, so this may be an option depending on where you work. A home version can be built with a standard treadmill (used is less expensive) and a bit of home assembly. Searching “DIY Treadmill Desk” online brings up lots of examples like thinkspace.com/super-cheap-diy-treadmill-desk. Get a biking desk. 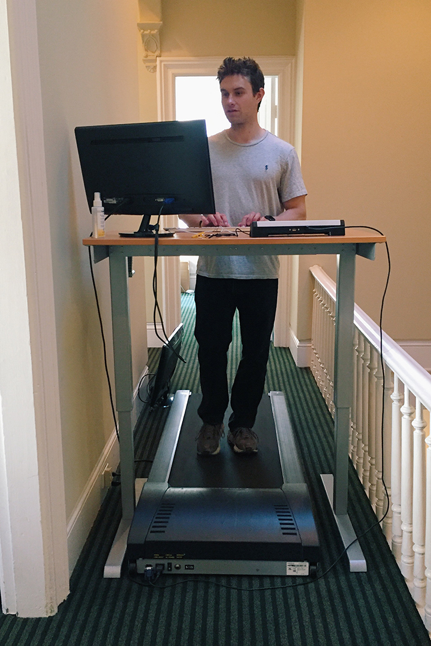 I tried one of these recently at a diabetes company and found it just as useful as a treadmill desk, but way less expensive and less bulky. Fit Desk makes a good option for $299 (www.thefitdesk.com/bike-desk). If I had space for a home office in my apartment, this would absolutely be my first purchase. 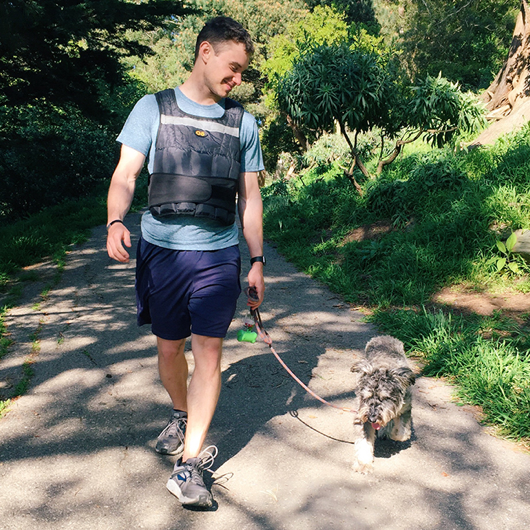 If walking doesn’t feel like “exercise,” try it with a weighted vest. I have a 20-lb option that I often use in the mornings and it works great for raising my heart rate while I stroll with my dog. Get Bright Spots & Landmines here as a free/name-your-own-price download. You can also purchase it on Amazon in paperback ($6.29) and Kindle ($1.99). The print book is priced at cost to ensure widespread access. 100% of proceeds from digital downloads benefit The diaTribe Foundation, a 501(c)(3) non-profit.